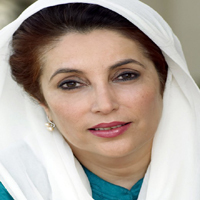 Benazir Bhutto born on the year 21st June 1953 is the first woman prime minister of a Muslim country. She served as PrimeMinister of Pakistan twice. Her father Zulfikar Ali Bhutto was also former ruler of Pakistan country. Benazir Bhutto was born in Karachi. She was interested in politics and serving people as she belongs to a big political family of Pakistan. She left her homeland for studies. She did her undergraduate at Harvard's Radcliffe College. Then she completed her degree in 1977 at England's Oxford University. After studies she came back to Pakistan when her father was the ruler of Pakistan at that time. Later she got into full time politics. She was elected as co-chairwoman of the Pakistan People's Party. Later she became Prime Minister of Pakistan at the age of 35. She was assassinated in Rawalpindi on 27th December 2007.